Special attention was placed on compact and high-quality but still economic design in the development of surface belt grinding machines used for wet grinding. 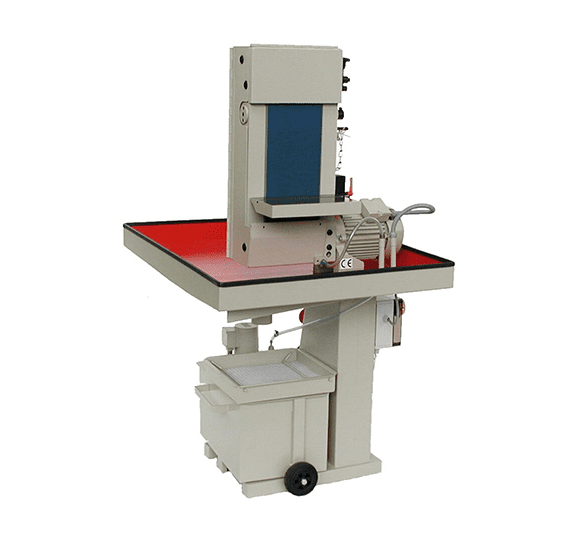 The surface belt grinding machines BS 75-W, BS 200-W and BS 300-W with integrated wet grinding device are manufactured with a reinforced drive motor. The large water bowl effectively catches the coolant and still allows unrestricted working on the machine. A top filter on the coolant tank retains the abrasive and impurities and thus guarantees a along service life of the coolant. Sturdy machine construction ensures vibration-free operation and, as a result a long service life even at high output. Surface belt grinding machines used for wet grinding are manufactured with especially strong drive motors. All surface belt grinding machines used for wet grinding have a closed protective edge case as standard equipment to hold back spray water and caught dust. The large water pan collects the spray water and leads this back to the water tank through the return column. A cap filter holds the removed stock and contamination back and ensures the maximisation of the spray water’s service life. Note: Anti-corrosive agents must be added to the spray water to ensure that the machines functions at 100%. We offer an optional auxiliary unit for grinding aluminium. This fulfils BGR 109 requirements – formerly ZH 1/32 (guideline for the prevention of dust fires and explosions when grinding, brushing and polishing).